Today's review is hopefully going to be of interest to you - a while back Beautynetkorea kindly sent me a bb cushion to review for you. The bb cushion has been trending in Korea in the last several months, and I've had a request or two from readers to review some, so today I will show you Innisfree's version of bb cushion. I've used Innisfree's melting foundation before and really liked it, so I was very curious about their bb cushion. The bb cushion is basically a new bb cream concept, where instead of a tube, the bb cream is stored in a compact and soaked into a sponge. Weird huh? Well, it's known that sponges can soak up, and hold liquids very well, but I still think it's rather odd to use it to store liquid makeup! But read on to see how it performs! Innisfree has very clean and simple packaging. The compact is sturdily made, comes with a mirror, and a separator to hold the puff applicator. 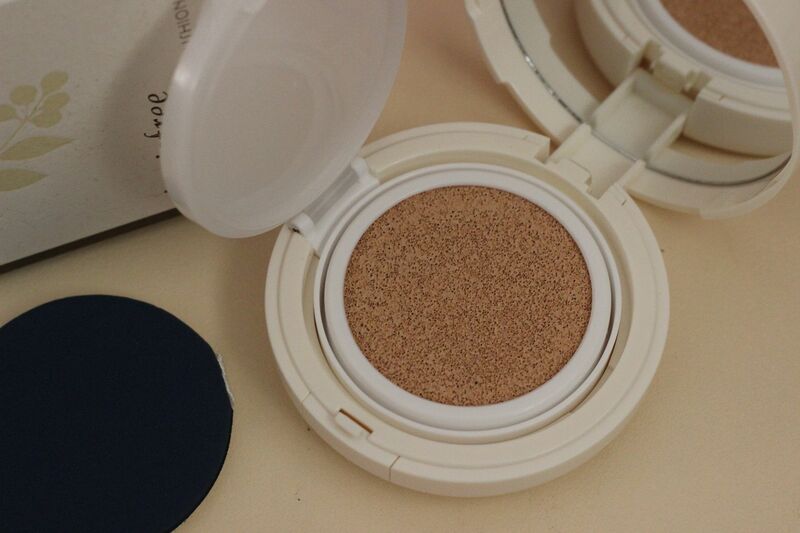 This bb cushion comes in 3 shades, and I'm using the middle shade. Can you believe that in that sponge there's 15 grams of bb cream? 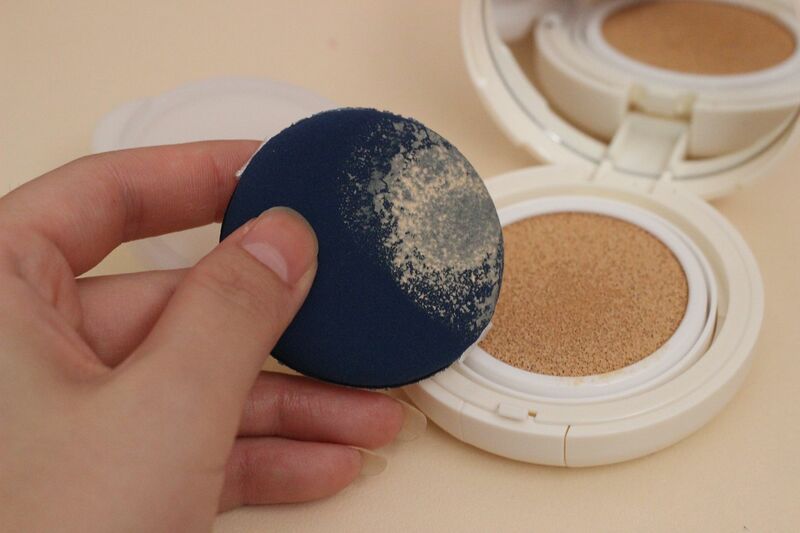 Notable things - this bb cushion has SPF50+! It also contains organic Jeju (an island in Korea) green tea water (green tea does good things for the skin since it's rich in antioxidants), instead of distilled water for that little bit extra bit of hydration for the skin. It's five purposes are whitening, UV protection, cooling, sebum control, and makeup. Aside from the unusual wet sponge packaging, the other notable thing about this bb cushion is the scent - Innisfree uses some natural ingredients, and their products tend to reflect that with herbal-ish scents, and this cushion is no different. It has a noticeable herbal scent, however I don't find it unpleasant - though I'm sure if you dislike fragranced products then this cushion may not be the one for you. The best method of application is definitely by the sponge puff provided. And although it may appear as if the puff hasn't picked up much bb cream, even if you press it hard, trust me, once you pat it to your skin you'll definitely see it. I was pleasantly surprised by the bb cream itself - I'm not sure if I'd call it a bb cream as it's very light and liquid-y, instead of the thicker bb creams I'm used to, but it's actually really decent! It has just the right amount of coverage suitable for day to day wear - it has light coverage, but can be built up to not-quite-medium coverage. I'm surprised by how buildable the coverage is, considering how thin and light the formula is! It doesn't cover bad acne scars or very red patches, but it's good for overall evening of skin tone. And it looks pretty natural on the skin - it must be the light liquid formula that allows it to adhere to the skin so well. I like how it makes my skin look fresh and glowy. Note that this bb cushion works best on hydrated skin - I wouldn't recommend this to dry skin types unless you use good moisturisers, as this could look patchy on dry flakes, or powdery on dry skin. Having dry skin I use a really rich cream underneath, and this bb cushion applies really naturally over it. But that's just my personal opinion about sponges - I'd still highly recommend this if you are on the lookout for a good bb cushion to try. Innisfree has always pleased me with the quality of their products so far. Hi, product looks really good. Do you think the darkest shade would fit NC 30? Does it have grey undertone or yellow? This BB cream looks great for daily wear. I haven't tried any cushion BB creams, but I think they are a bit complicatied to work with. I would prefer the usual squeeze tube or pump. It looks very good on you! I am not quite sure if I wanna try one of these. If something gets inside the sponge it will be bacteria paradise. I haven't tried any cushion foundation or BB cream mainly because of the same reason like yours about the sponge concept. I think it is so interesting but kind of unnecessary and unhygienic.. I really like the result! For now I have tried only one Cushion, and every cushion look awesome! I want to try a BB cushion just for the experience. Plus I think it will be really convenient! Definitely want to try this out when I've decreased the size of my face makeup collection! Your face already looks sooo good before any BB cream! *_* I agree that I don't really like all the product soaking into the sponge. It almost feels like a bit of a waste. 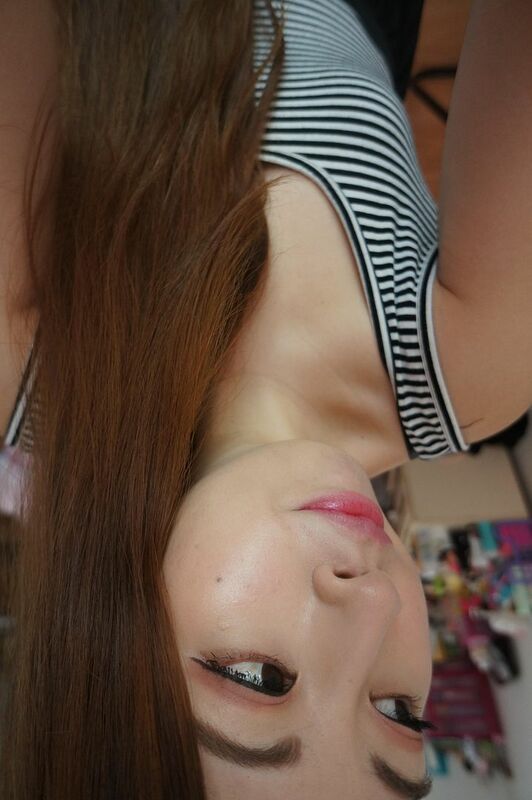 :S The BB cream itself seems to do a pretty good job though! I think the cushion thing is such a weird gimmick, to be honest I can't even believe it has caught on. It's great that it can't really leak in your purse, but like you said it seems thin since it has to soak into the sponge and it takes too long to pat it around your face. I bought a "make your own cushion" thing from APIEU but overall this is a trend that I hope passes. Great review! what shade u got here? which one u prefer between this n mineral melting foundation? Back then I always thought using sponge would be inconvenient but I think its better to use it than brush.. I'm actually really interested in the product. I feel like it can be a travel friendly product. One time i was in the train, i saw a korean lady with a bb cushion. It looked so easy to apply and travel friendly ^^ Must be great for touch ups or on the go cause you don't have to whip out a brush or use your hands (if on the go, ew). The third shade is called 'true beige' so I think it has yellow-beige undertone. Mine is the middle shade and it suits my yellow undertone skin just fine. I'm not sure whether it would fit NC30 as unfortunately most bb creams in Korea tend to suit NC20-25 best. The darkest shade does look like it could match NC25-30, though I'm guessing it may be too pale for NC30 since this bb cushion focuses on whitening and brightening the skin. Hehe, I wonder what the next bb cream concept will be? I don't think I will try any more cushions now that I've satisfied my curiousity! 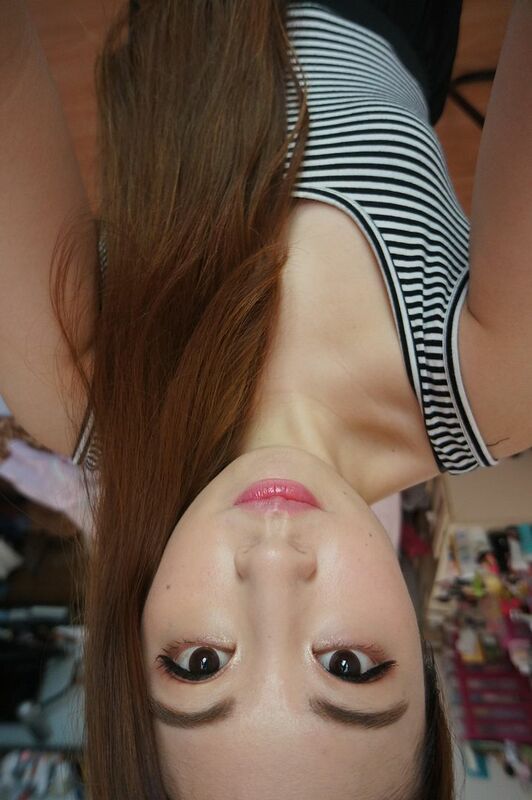 I wish Korean brands had more shades too! Since they are getting so popular internationally I hope they can expand more! I remember reading your reviews on those - IOPE seems to be a really popular one too! 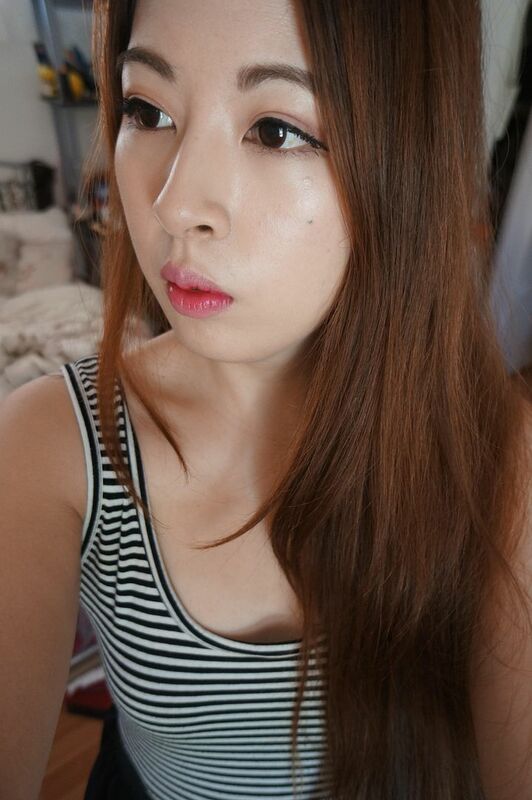 It felt as light as a cc cream, but almost had the coverage of a bb cream, so the best of both worlds I guess! Though I guess people like it because the runny texture adheres pretty naturally to the skin. But I liked how well the sponge applies the bb here, it looked quite natural and even. Hehe, I wonder if a new bb concept will be coming soon? I have shade #2 (the middle shade of 3 shades). Ooh, that's a hard question! I think this cushion is more suitable for Summer as it feels lighter, but the melting foundation has better coverage! I have oily skin (specially the T-zone) would I need to put powder over it ? And how long is the staying power ?